(ARC) . I. Development of the ARC . during World War I . The American Red Cross rapidly expanded after receiving its 1905 Congressional charter. 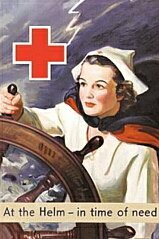 Separate Red Cross services were created for Nursing, First Aid, Lifesaving and Sanitation. Health care awareness and traffic safety (then mostly railroad and streetcar) was emphasized. In 1908 the American Red Cross began using a paid staff of technical experts to oversee and coordinate its mostly volunteer workforce. She was elected to the Red Cross governing board in 1901. Although she always remained a volunteer and never took over the highest executive position in the ARC, she was considered as the organization's real chief most of the time. Under her guidance many new Red Cross programs started. She resigned in 1944. The outbreak of World War I during 1914 revived the "romance" of civilian battlefield assistance that lingered from its Civil War heritage. However, much of the early enthusiasm was rather naive. Meanwhile, the American Red Cross was transformed completely to adapt to its new role as a civilian war emergency relief foundation. 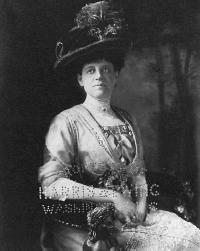 Mabel Boardman lost most of her authority as President Wilson's War Council shifted its allegiance to Eliot Wadsworth. Wartime patriotism filled the American Red Cross with throngs of eager volunteers and increased funding through well-organized War Fund drives. 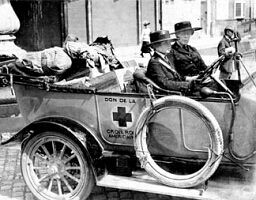 American Red Cross car in 1917 ... The American Red Cross was able to add a Motor Corps (initially transport of donated supplies), a Canteen Service (soldier welfare buses), a Production Service (initially bandage-making) and a Home Service (soldier cable contact with hometowns). 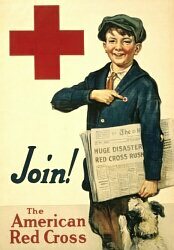 The Junior Red Cross was formed for participation by schoolchildren. 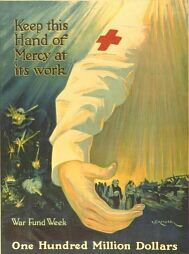 When the United States declared war in 1917, the well-financed and socially popular American Red Cross fielded an active civilian contingent overseas that helped with innumerable humanitarian projects and provided soldier assistance from hospitalization to rehabilitation.
. Much American Red Cross work was extraordinary. Care packages and mail parcels were delivered to prisoners through coordination with the German Red Cross, a breakthrough in international cooperation. 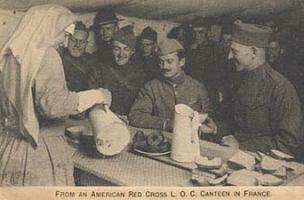 The new Red Cross Outpost Service drove stoves to the front trenches to offer hot food. Red Cross dogs (trained by female handlers) rescued wounded and gassed soldiers by directing litter teams into no-man's land. Finally, during the lethal 1918 influenza pandemic that came at the end of the war, the Red Cross responded with 15,000 nurses and other healthcare practitioners under the US Public Health Service. 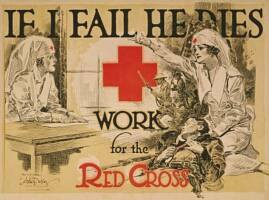 Red Cross female volunteers proved their sturdiness and several died in the performance of their voluntary duty. ..
.. Following World War I, the Red Cross maintained hospitals, convalescent homes and living facilities for millions of war refugees within Europe. In Asia, Red Cross "white trains" operated inside Siberia (where American troops safeguarded the Trans-Siberian Railroad) to relieve distress in that region. The American Red Cross provided vital assistance to Japan after the devastating Tokyo earthquake. 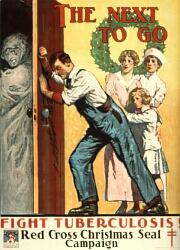 The postwar Red Cross concentrated on problems at home. Many volunteers served at veteran community hospitals. 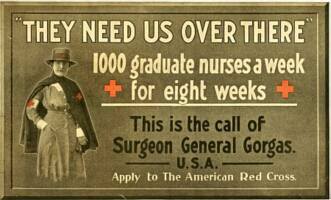 The Red Cross became heavily involved in the Great Depression and the resulting unemployment crisis. Nearly 2,500 public health nurse services insured continued medical care where local resources were lacking. ..
. The Red Cross intensified disaster preparedness programs. During tornado and flood emergencies, Red Cross medical and technical personnel arrived to give free medical care, distribute food and clothing, arrange shelter and help register and account for victims. During 1938, the widespread adoption of popular uniforms greatly increased volunteer ranks.